As we get closer to the launch of the so-called "iPhone 8" in the fall, a new report out of Apple's supply chain today confirms that the company has begun mass producing components for all three of 2017's iPhone models. The report corroborates what has been rumored for well over a year: Apple will launch two iterative iPhone updates sized at 4.7 inches and 5.5 inches, along with a 5.8-inch model that includes the first ever OLED screen on an iPhone. According to DigiTimes' sources, the 4.7-inch and 5.5-inch iPhones will include a reinforced glass chassis and an aluminum metal frame, while the 5.8-inch iPhone will feature the same reinforced glass chassis and an unspecified "metal frame." Recent rumors have largely agreed that the iPhone 8's frame will be made of stainless steel, similar to Apple Watch. Samsung Display is one of the manufacturers currently in component production on Apple's next-generation iPhones, and is said to be ready to supply up to 80 million AMOLED panels for the 5.8-inch iPhone 8 in 2017, falling between the 70 million and 92 million previously rumored. Samsung Display is set to supply up to 80 million AMOLED panels for the new 5.8-inch iPhone in 2017, according to sources from the upstream supply chain. Samsung Display's remaining capacity, which is expected to output another 80 million AMOLED panels in 2017, will be used to supply orders from Samsung Electronics and its other smartphone clients, but the panel maker is expected to keep some flexibility in case Apple places additional orders, the sources noted. The manufacturer will be capable of outputting another 80 million AMOLED panels this year, but that half will be focused on orders from Samsung Electronics and other, non-Apple smartphone clients. Sources did say that if Apple were to increase its orders, Samsung Display "is expected to keep some flexibility" in its supply chain to cut down orders elsewhere and compensate its output for the Cupertino company. 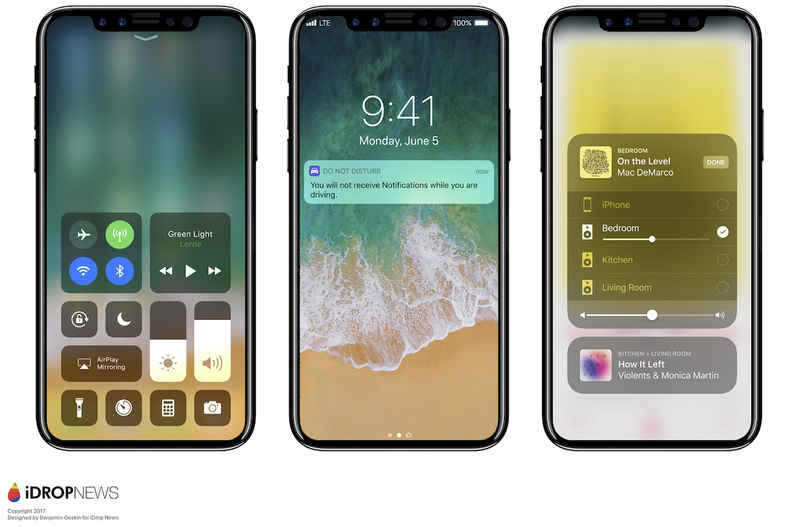 In a separate article posted online this week, speculative renders shared by iDropNews have taken a look at what the iPhone 8 might look like running iOS 11. 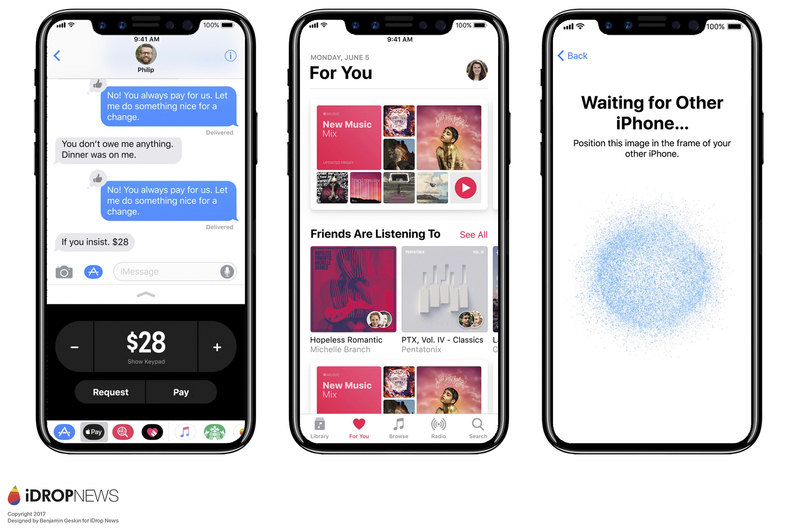 The renders have kept the overall same look as ones posted online in May, but now offer glimpses into what new iOS 11 features -- like peer-to-peer Apple Pay, the redesigned Control Center, new Lock Screen, Apple Music, and more -- could look like on iPhone 8. The new renders continue the rumors that iPhone 8 will include Touch ID embedded underneath the iPhone's display, and not on the back of the device or in the lock button. Facial/iris scanning and wireless charging are also potential inclusions on the new iPhone 8, and a vertical dual-lens camera has been suggested by multiple sources over the past few months, making it one of the more likely features of the OLED iPhone. 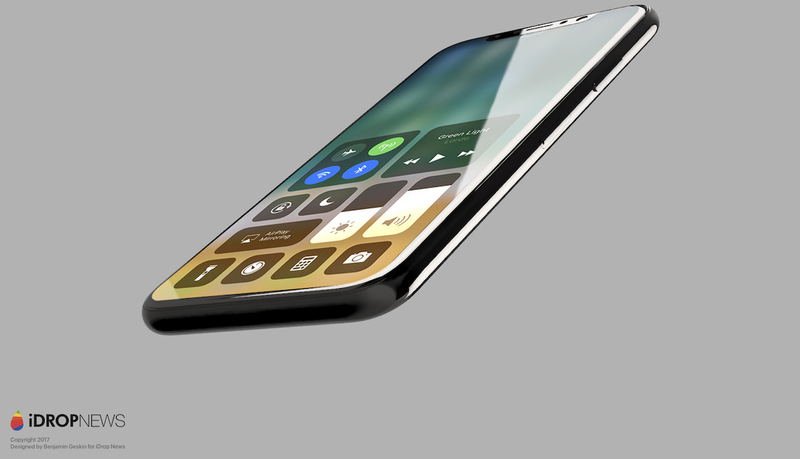 The sensor bar at the top of the device houses the iPhone's front-facing cameras, proximity sensor, ambient light sensor, and earpiece, and remains one of more uncertain aspects of the iPhone 8's design, according to iDropNews. It’s still unknown which iOS design choice Apple will implement regarding the unusual top half of the iPhone X’s display, which is covered partially by the bar. Apple could go one of two ways with this design – 1.) iOS could employ the entire display, ignoring the bar, (as shown in the photos provided) to display full-size pictures, backgrounds, screensavers, apps, and more. This would be the most striking and unique option, however that could be a tricky prospect for app developers who would be required to navigate app or game interfaces around the center bar. 2.) The second, and more conservative, option would to black-out or white-out the portions of the display that are separated by the center bar, and use contrasting color icons for battery, signal strength, Wi-Fi strength, time etc., leaving a traditional rectangular display beneath. Exactly when users will be able to get their hands on the iPhone 8 is still up in the air. In DigiTimes' report today, analyst Luke Lin said that the 5.8-inch iPhone will see shipments between 50-55 million units in the second half of 2017. The catch is that mass production on the iPhone itself -- not just its components, like today's display and chassis report -- "is unlikely to start until after mid-September." In the third quarter specifically, production volumes are expected to only be around 3 million iPhone 8 units. This news largely falls in line with reports from earlier this year that said the iPhone 8 will be hard to obtain in 2017, with Ming-Chi Kuo stating in April that the OLED iPhone would face "severe supply shortages" for some time, and believing production ramp up for the device won't begin until as late as October-November. This would put iPhone production two months behind previous ramp-ups in August-September -- a belief also supported by Bloomberg, analysts from Barclays, and Brian White. Still, not all analysts believe there will be delays, as Morgan Stanley said in May that its Greater China Technology Research colleagues have "not yet seen delays in the supply chain." Morgan Stanley believes iPhone production will start on time for most components, leading to a typical launch window for the new iPhone. The other two iPhone models are predicted to be more easy to obtain, with combined shipments of the 4.7-inch and 5.5-inch iPhone 7 and iPhone 7s expected to reach 25-30 million units in the second half of the year. Do we really think the sensors/camera/speaker will be designed to cut into the screen like that?!? I totally called this last year when I said the next iPhone would be rectangular and with a screen. Funny thing is every year we have to reach harder and harder to find something to complain about. "That bezel is like a millimeter way too wide!" "They got rid of the home button but still haven't invented technology to make the camera invisible? Sad!" "12 hours of battery? What if I'm stranded on Mars?" "The camera bezel is vertical!? Why do I even bother getting out of bed :( "
The money made from these phones will help finance the space ship campus to actually fly. I sure hope not. That looks TERRIBLE. Tired of seeing people butcher the concept, here's my edit that I made using ****** MS Paint. I really think the top area will stay black, looks much better this way. Looking more and more like a Samsung Galaxy. Still no mention of TouchID sensor placement. Personally I'd hate for it to be on the back of the phone. I would think the screen at the top - where the signal bars, time, battery life, etc. are - would be a black background with white icons and text. That way it would appear as though it's black all the way across, making the main portion of the screen rectangular. There have been many reports the last couple weeks to confirm Touch ID will be embedded in the screen. You don't have to worry about that aspect.